I've been thinking a lot about my family lately, specifically my parents, because they're about to embark on some major changes along with us. Aside from my husband and I expecting our first child in a few months, my parents are planning to move overseas to the Philippines. My mom has been retired for the past few years but now my dad has made the decision to retire as well. They've work long and hard over the years and now it's their time to rest, relax and enjoy themselves together. However their move isn't going to keep them far for too long. They'll be coming back to Stateside every 3-4 months to get their medical checkups, indulge in the luxury of some American food and ingredients and of course, spend time with their new grandson (and other family here.) Although they will be leaving in April, they'll be flying back sometime in July to host our baby's Christening/Baptism. Given that they will be half way around the world in a few months, I'm remembering all the wonderful food-filled memories they gave me while growing up. It's my parents who really have inspired me to be quite the foodie to begin with... and for all they taught me in and out of the kitchen, I'm ever so grateful. One food memory involved going to a Sara Lee Outlet. My mom *loves* Sara Lee pound cake and when they found out there was a Sara Lee Outlet somewhere in Chicagoland, we took a family trip out there. We drove about an hour on a cold, rainy fall day. It's kind of funny thinking about it now because we were so determined to go to this place despite the horrible weather conditions. Once we finally get there, we're starved. We grab a cart, fill it up with 'imperfect' pound cake, cheesecakes, pies, etc. But all I wanted was a blueberry muffin. You know, those individually wrapped ones displayed by the register? Yep. That's all I wanted. Fast forward to today, it's a three-day weekend for me so why not start a day off with something delicious? This morning I baked up these amazing blueberry muffins... seriously amazing! Yes, they're even more delicious than that Sara Lee muffin I had years ago! The recipe comes from Cook's Illustrated. 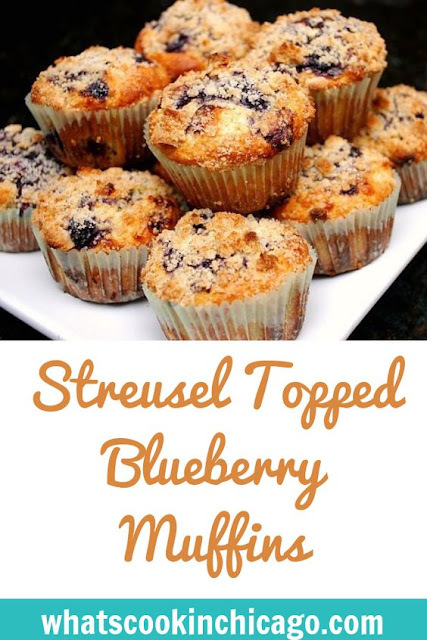 I prefer muffins that have a streusel topping - often the best part of the muffin if you ask me. Since we're in the middle of winter, fresh blueberries come at a price so I opted for frozen blueberries instead. Regardless, these came out fantastic - moist, flavorful, just the right amount of sweetness. What makes this recipe a bit different from others is the homemade blueberry filling that's swirled into the batter in addition to the blueberries already added in. It really gives a nice burst of blueberry flavor without being overly sweet. Another great thing about making these muffins is that they can be individually wrapped in plastic wrap and placed in a freezer safe bag to enjoy later. When you're in a rush for breakfast or in need of a sweet snack, just grab one out of the freezer, let it come to room temp and enjoy! FOR THE STREUSEL TOPPING: Combine all the dry streusel ingredients in small bowl. Drizzle with the warm, melted unsalted butter and toss with fork until evenly moistened and mixture forms large chunks with some pea-sized pieces throughout. FOR THE MUFFINS: Adjust oven rack to upper-middle position and heat oven to 425 degrees. Spray standard muffin tin with nonstick cooking spray (or use baking liners if you prefer). Bring 1 cup frozen blueberries and 1 teaspoon sugar to simmer in small saucepan over medium heat. Cook, mashing berries with spoon several times and stirring frequently, until berries have broken down and mixture is thickened and reduced to ¼ cup, about 6 minutes. Transfer to small bowl and cool to room temperature, 10 to 15 minutes. Rinse the remaining cup of berries under cold water and dry well. Toss dried berries in 1 tablespoon of flour and set aside. Whisk the remaining flour, baking powder, and salt together in large bowl and set aside. Use an ice cream scoop or large spoon to divide batter equally among prepared muffin cups (batter should completely fill cups and mound slightly). Spoon teaspoon of cooked berry mixture into center of each mound of batter. Using chopstick or skewer, gently swirl berry filling into batter using figure-eight motion. Sprinkle prepared streusel evenly over muffins. It is must be delicious, cooking the blueberry filling. What a good idea. Is that why the oven is so high? The wetter filling takes longer to cook? What a cute memory! I'm sure you're going to miss your parents a lot, but it sounds like they're very ready for the next step in their lives. These muffins look so good... want to bring me some for breakfast tomorrow? What a shame that your parents are moving so far away - especially with the impending birth of your first child. My husband loves blueberry muffins, so I'll be giving these a try! I made "healthy" muffins over the weekend with no sugar!! It was ok,but bring on the streusel! I'll be trying this instead. Looks too good to pass up. I remember the days of going to the Sara Lee Outlet. Haven't been in years. I miss my pound cake!! These are the best blueberry muffins I think I have ever made! The filling is what makes these so wonderful. another buttermilk substitute is to pour 1 Tbsp into a liquid measuring cup then add milk till 1c. total liquid. after having to give up dairy due to my infant's reactions to it coming through my breastmilk I've used this method with rice milk with success. The rice milk makes for baked goods that are a bit more crumbly, but they hold their form with a decent consistency overall. (I have food reactions to the other dairy substitutes).